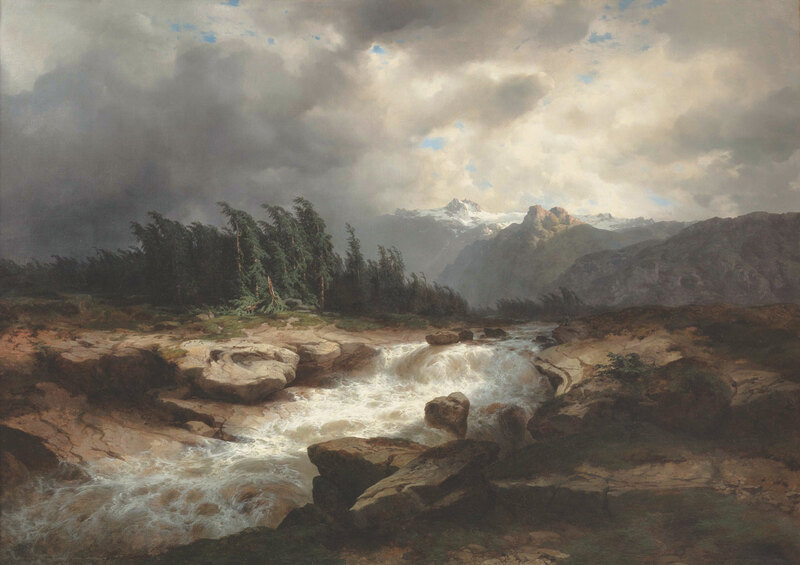 Mountain Torrent Before a Storm (The Aare River, Haslitel) by Alexandre Calame, 1850. Oil on canvas. Collection of Asbjørn Lunde. Western Landscape, Mount Whitney by Albert Bierstadt, 1869. Oil on canvas. Newark Museum purchase in 1961, The Members’ Fund. View of Mont Blanc by Gabriel Loppé 19th century. Oil on canvas. Collection of Asbjørn Lunde. Snow Storm: Hannibal and His Army Crossing the Alps by J.M.W. Turner, exhibited 1812. Oil on canvas. Tate Britain, London. Accepted by the nation as part of the Turner Bequest 1856. Courtesy of The Metropolitan Museum of Art/©Tate, London 2017. New York City, Morris K. Jesup Fund. 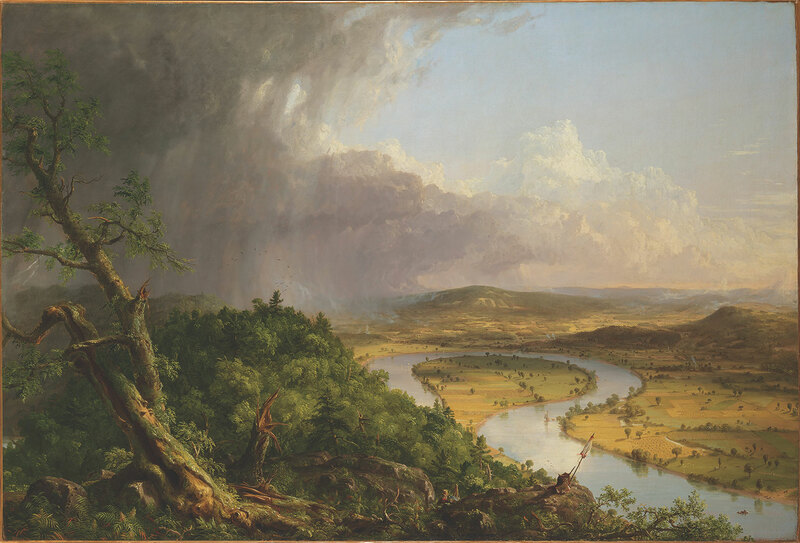 View from Mount Holyoke, Northampton, Massachusetts, After a Thunderstorm—The Oxbow by Thomas Cole, 1836. Oil on canvas. The Metropolitan Museum of Art, New York City. Gift of Mrs. Russell Sage, 1908. 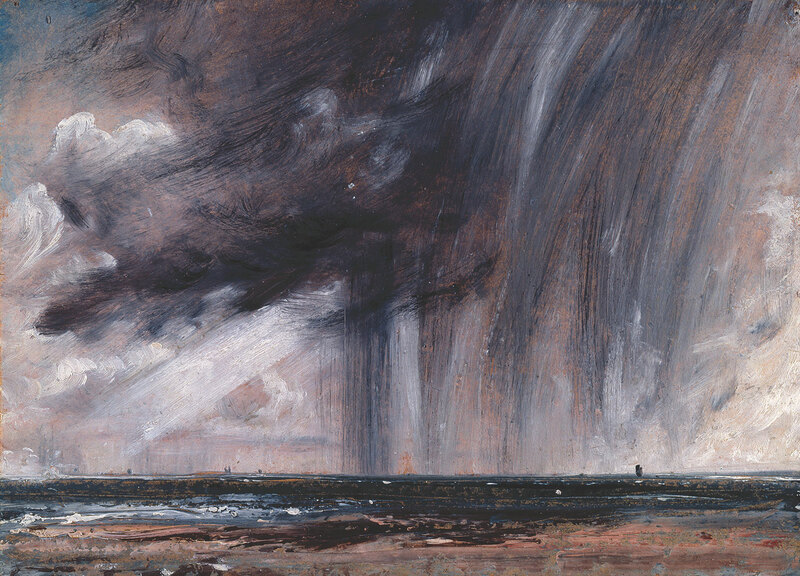 Rainstorm Over the Sea by John Constable, ca. 1824-’28. Oil on paper laid on canvas. Royal Academy of Arts, London. Given by Isabel Constable, 1888. Two local exhibits shed light on the relationship. The Hudson River School was America’s first home-grown art movement. It is still a source of national pride, both because of the artists’ ingenuity and because its subject was the country itself. It is “America, the Beautiful” in paint. The movement dominated American art for most of the 19th century, from its founding by Thomas Cole in the 1830s through the monumental panoramas of Frederic Church and Albert Bierstadt to the work of second-generation masters such as George Inness and sub-schools and spinoffs such as the Luminists and Tonalists. As such, a certain amount of mythologizing was inevitable. As typically told, the story is a little too simple. Just how homegrown were its ideas? Were its painters really in such a swoon over picturesque scenery or did they have something else to say? In recent months, two local exhibits have taken a deeper, more nuanced view of this history. At the Metropolitan Museum, “Thomas Cole’s Journey: Atlantic Crossings” explored Cole’s travels abroad and the influence of such artists as J.M.W. Turner, John Constable and Claude Lorraine. That show closed May 13, but it has left behind a beautiful catalog published by Yale University Press. And there’s still plenty of time to see the Newark Museum’s fascinating show “The Rockies and the Alps: Bierstadt, Calame and the Romance of the Mountains” (on view through August 19). This is the inaugural exhibit of Newark’s newly renovated Special Exhibition Gallery. Like the show at the Met, it identifies European sources for this indigenous school. But it goes a step further and finds a parallel world to the Hudson River School. Call it the Alps School. Led by Swiss artist Alexandre Calame, the group took inspiration from the Matterhorn and Mont Blanc just as Bierstadt and company did with the dramatic peaks of the Rocky Mountains. 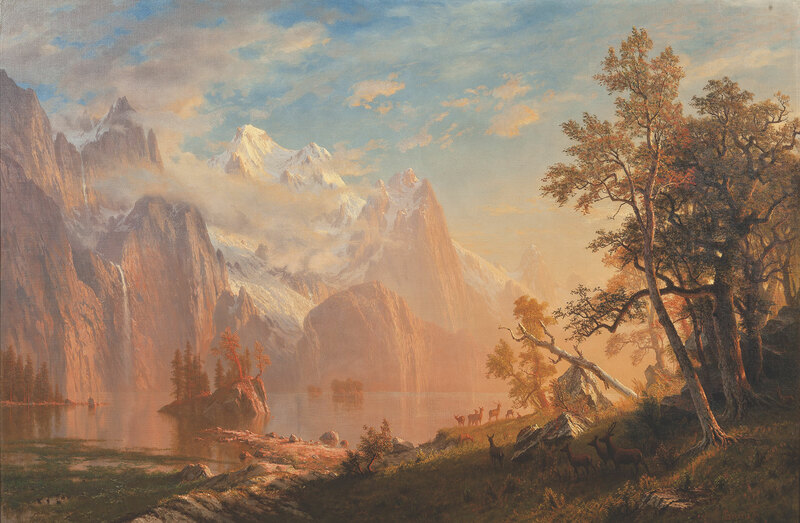 Although Bierstadt and Calame get top billing in Newark, the show throws a wide net, taking in the natural history of the American West, Native American culture, the mass production of alpine imagery and the roles of tourism and conservation. Along the way, visitors are introduced to the core idea of Hudson River School art—that of “the sublime.” Its source was Irish philosopher Edmund Burke, whose 1757 treatise argued that people were pleasurably moved not just by beauty, but by awe and even fear of natural phenomena. 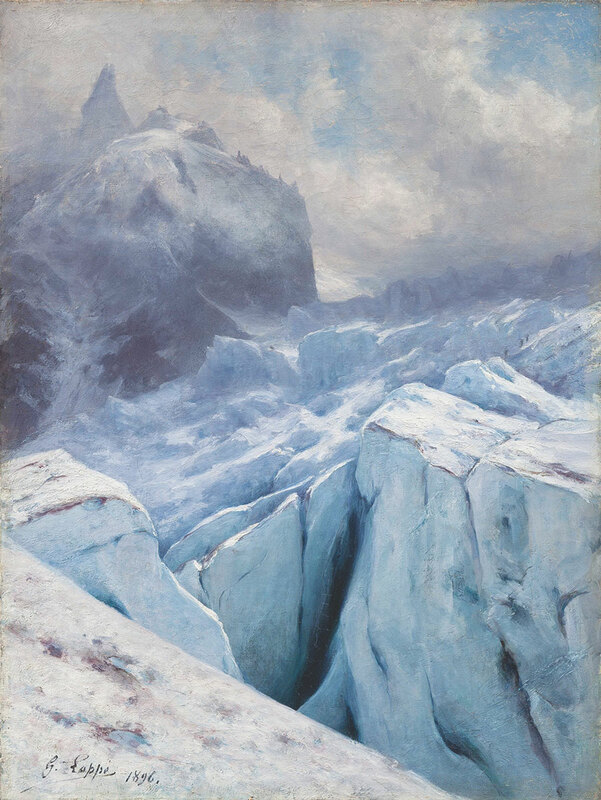 There’s nothing beautiful, for example, in French artist Gabriel Loppé’s view of the glacier atop Mont Blanc, but the bleakness and hostility of all that ice thrills us in a different way (View of Mont Blanc). Calame, relatively unknown to art lovers on this side of the Atlantic, was a master at rendering the spring torrents that transformed alpine creeks and streams into raging rapids. His stormy scene of the rushing Aare River is a textbook example of the sublime (Mountain Torrent Before a Storm). Bierstadt—German-born, American-raised and European-trained—­perfected an art that teetered between beauty and sublimity. You can see this in the Newark Museum exhibit’s signature image, Western Landscape, Mount Whitney, in which forbidding ice-covered peaks are swathed in pink twilight, rendered dreamlike by the reflective alpine lake and a foreground shoreline where deer calmly forage. Cole was born and raised in England and didn’t come to America until he was 17. His only artistic training was some youthful work in commercial engraving. He taught himself to paint from a book. After a brief stint as a portrait painter, he turned to landscape and found his theme in the special wildness of American scenes. He played up that wildness in pictures of stormy mountaintops, storm clouds (Clouds), blasted tree trunks and dense woodlands that look like the forest primeval. Within 11 years, he was the premier landscape painter in America. The Metropolitan’s American Wing exhibit picks up Cole’s career here, following him to Europe. It mounts several big Turner paintings that influenced Cole. 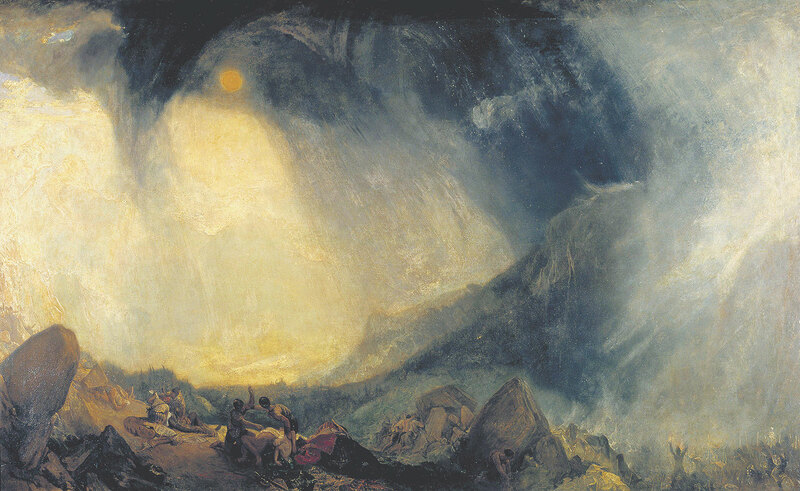 The most dramatic is Turner’s take on an event from 218 BC, the crossing of the Alps by the army of the Carthaginian general Hannibal (Snow Storm: Hannibal and His Army Crossing the Alps). Turner, always searching for opportunities to render light and atmosphere, shows the tiny soldiers being threatened by the maw of an alpine snowstorm. On returning from his European tour, Cole painted two of his most famous works. The Oxbow is a panorama of the Connecticut River Valley that sets up a contrast between two realms. 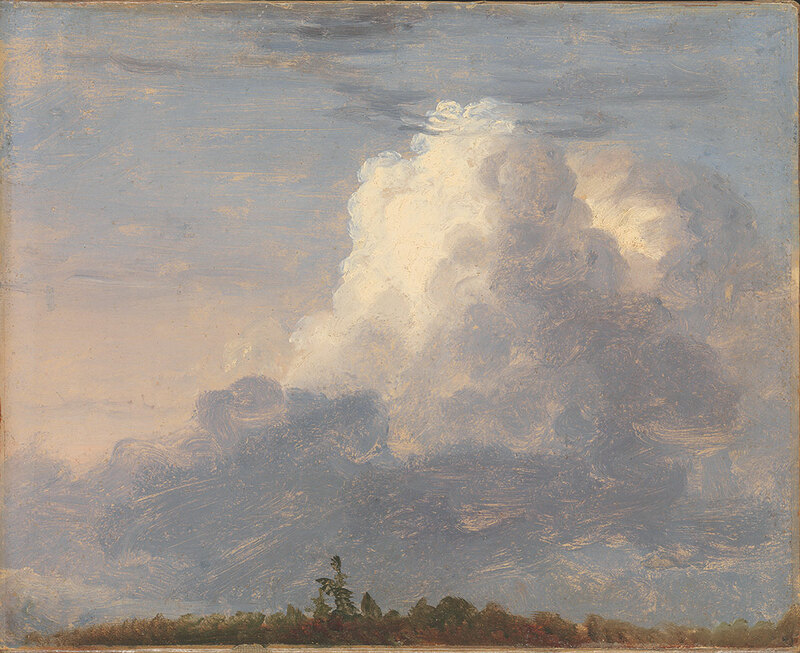 On the left is wild nature, a Turneresque storm over the mountains. On the right, as far as the eye can see, are lands cultivated into neat little patches. The contrast reflected Cole’s fears that the American Eden would be destroyed by unrestrained enterprise, just as the English countryside was being consumed by industrialization. Cole’s sojourn in Italy impressed on him the transience of human civilizations. The five-painting ensemble, Course of Empire, charts the growth of a society from its wild and pastoral states to an ostentatious, decadent empire. In the penultimate panel, it is conquered and destroyed by barbarians. In the last, its moonlit ruins are being slowly subsumed by nature. Few if any of the other Hudson River School artists shared Cole’s interest in allegories or storytelling. In fact, they were much more likely to have a scientific orientation. Some played the role of explorers and were part of government-supported survey expeditions. Of these, some collected rocks or plant samples. Others were drawn to the lives of Native Americans, including the young Ralph Blakelock. He later became a painter of romantic nighttime scenes but is represented here by an 1871 painting of a Plains Indian encampment. One section of the Newark exhibit is devoted to popular mountain imagery. Visitors are invited to play with reproductions of 19th century stereoscopes, binocular viewers that create the illusion of three-dimensional space. Columnist John Zeaman is a freelance art critic who writes regularly forThe Record and Star Ledger newspapers. His reviews of exhibits in New Jersey have garnered awards from the New Jersey Press Association, the Society of Professional Journalists (New Jersey chapter) and the Manhattan-based Society of Silurians, the nation’s oldest press club. He is the author of Dog Walks Man (Lyons Press, September 2010) about art, landscape and dog walking.